High Speed Technologies has been repairing spindles since 1986. 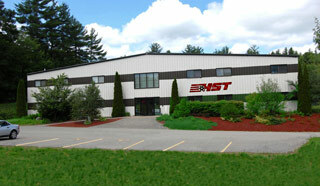 HST is one of the most experienced independent spindle repair facilities in the U.S.
Each senior technician has more than 15 years of experience and is OEM-trained. Our database of more than 100,000 spindle repairs proves our experience with virtually every type and model. Production-critical spindles can be repaired within 3 days. Our FEQA analyzes the cause of failure and provides recommendations to avoid future failures and improve spindle performance. Modern equipment provides super-precise balancing and analysis of your spindle. In-house grinding to micron precision. Our Certified Big Plus spindle repair shop meets OEM specification for tool interface repair, with calibrated and certified test equipment and a climate-controlled work environment. We use only ABEC 7 or better for all rolling element bearings. Our warranty on repaired spindles meets or exceeds OEM warranties. We’re big enough that we have a fully equipped facility for all machine tool spindles rebuild and repair work, and small enough that we know every customer, and every customer is very important to us. We are nice people to work with! Started by an expert spindle technician and built on a mindset that stresses customer service, we have the experience that others wish they had. We’ve come a long way from Ralph Frisella’s garage back in 1986. 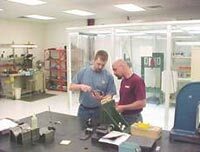 Specialized equipment, a class 10,000 clean room, and in-house grinding are just a few of the things that help us provide OEM-quality spindle repair. And just as in 1986, a real person will answer the phone when you call during business hours. Our commitment to customer service hasn’t changed. 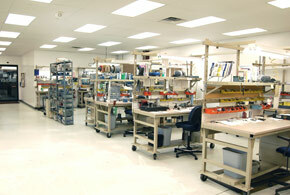 Our assembly area is specifically laid out for spindle repair. A filtered air-conditioned environment, clean-room ceiling tiles and an epoxy sealed floor are a few of the considerations included in our modern spindle repair facility. At HST your spindle will be treated like the fine precision instrument that it is. HST repairs all types of spindles. From the very large to the very small, our technicians have the training and experience needed. Motorized or non-motorized, air bearing or rolling element, we can repair, run-up and test your spindle. Ralph saw the company he worked for losing valuable production time waiting for the OEM to repair spindles. He realized there was a need for a faster and more reliable spindle repair service. He also knew that few machine shops could achieve the precision required to repair a spindle. So, in 1986 he went about creating a facility specifically set up to provide OEM-quality spindle repairs. This effort would grow to become High Speed Technologies, Inc.
From inception, Ralph built HST on the cornerstones of technical competence and highest quality. His reward was a broad and loyal customer base. HST maintains a diverse spectrum of customers ranging from large American automotive manufacturers to the local shop right down the street. Regardless of customer size, Ralph insists that each spindle is repaired to the highest industrial standards. It is a mindset that permeates HST. Yes, HST has modern balancing equipment, vibration analysis and grinding capabilities to better than 50 millionths of an inch. What sets us apart are our senior technicians and machinists, each of whom has more 15 years of experience (and thousands of repairs). They know how to make this equipment work for you. Repairing high-performance precision spindles requires skill sets honed to match the spindle requirements. 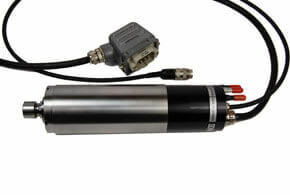 Spindle technology is constantly evolving and improving. To stay viable, our technicians must constantly upgrade their skills. We participate with certain high-end machining center OEMs with ongoing training. Our technicians train at their facility and the OEMs send their technicians to our facility for refresher courses or updates on new products. Besides spindle OEMs, HST technicians train with component manufacturers such as OTT, Schenck, Vitek, Barden, NSK and various other bearing manufacturers. Spindle repair, that’s what we do!